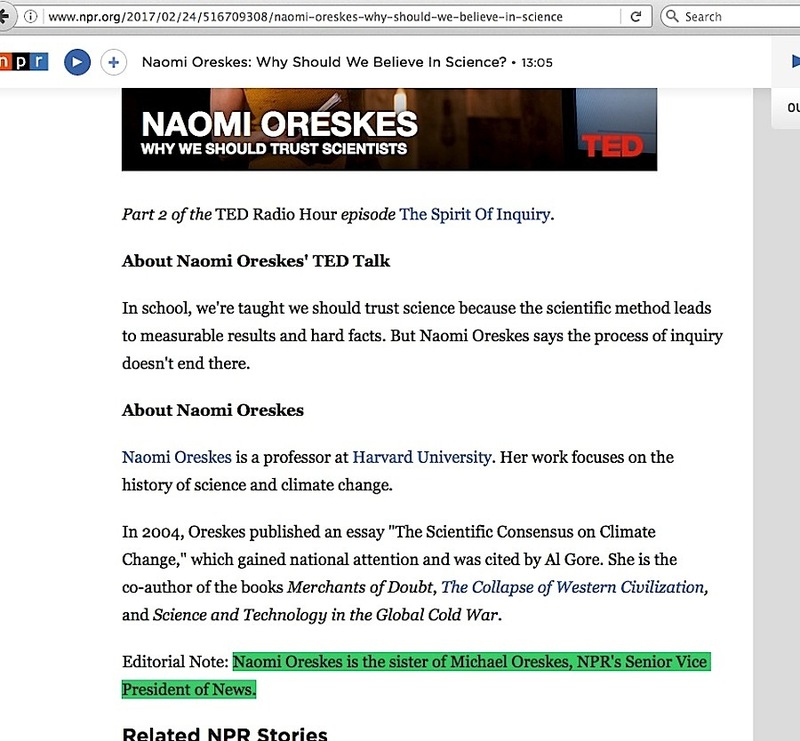 If anyone had engaged in a one-word internet search of the name “Oreskes” prior to October 31st, 2017, the results would have largely been for Naomi Oreskes, famed ‘exposer of corporate-corrupted skeptic climate scientists,’ with a sprinkling of other references to National Public Radio Chief Editor Michael Oreskes. After October 31st, albeit largely buried by news of the Manhattan terrorist attack, the news about Michael Oreskes’ alleged indiscretions was hard to miss. Oreskes is an unusual surname. 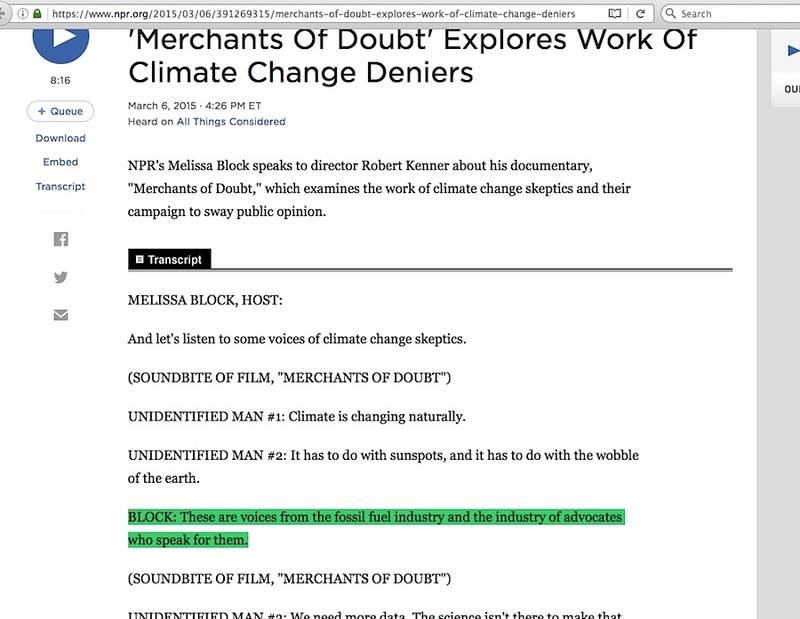 Focused as my internet searches were for people surrounding the origins of the ‘crooked skeptic climate scientists’ accusation, I ignored results showing Michael Oreskes as just a shared name coincidence. A combined search of the names Ben and Louisa Oreskes revealed them as Michael’s children. This prompted me to enter the combined search of Naomi and Michael, and one result straight from NPR webpages showed they are brother and sister. Now we have a larger potentially troubling journalism problem. 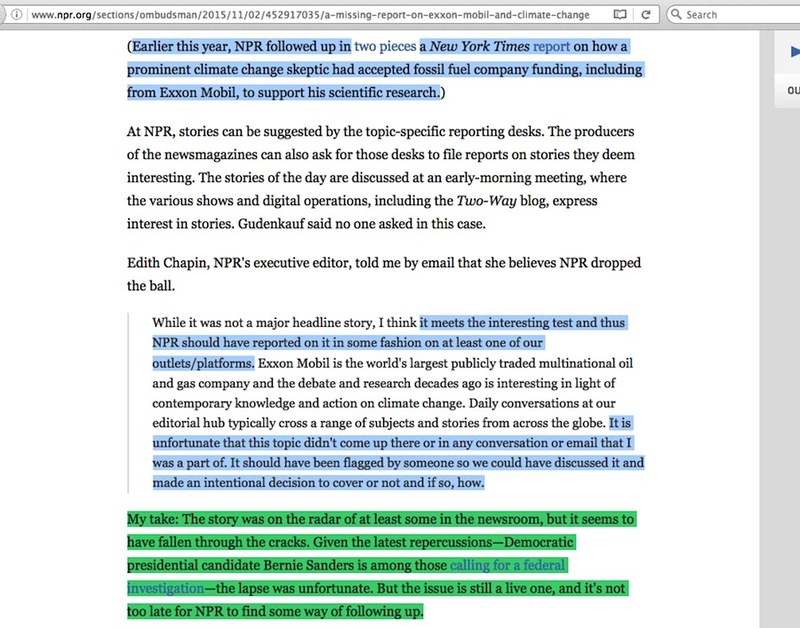 Do a site-specific search of the NPR organization’s mentions of Naomi Oreskes, and you won’t find a single news item containing anything remotely negative about her work, despite readily found criticism of her infamous “100% global warming science consensus” position which diligent NPR reporters could have found years earlier entirely on their own. 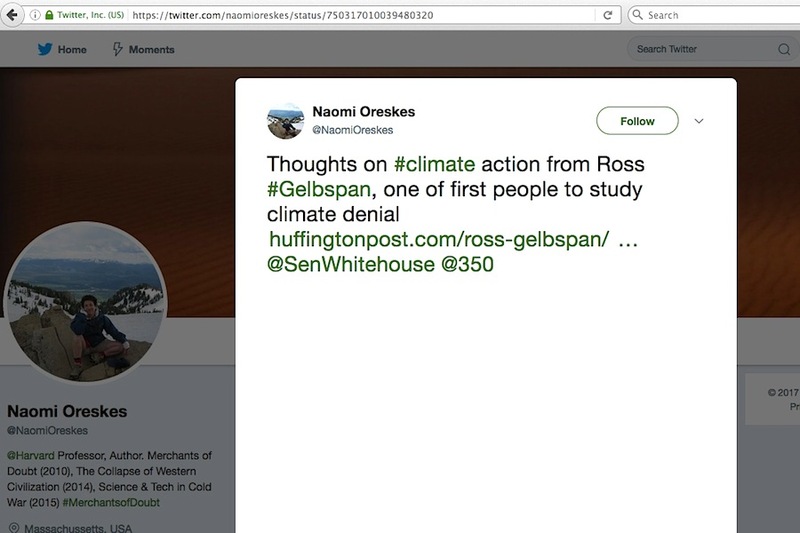 Then there are the tales Naomi tells about how she entered this global warming arena, which evidently nobody questions even though an elementary inquiry into ordinary details about them yields not-especially-difficult-to-find contradictions. Even the simplest accolade in one of her Tweets is something which begs for extended questioning when anyone dives into details of who she was praising and how her praise of him falls apart. 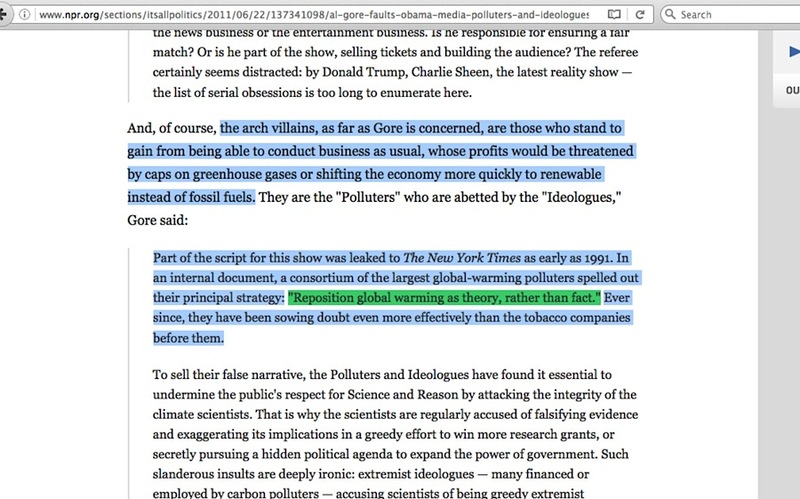 … if Mike ever did try to influence our climate change coverage in a way that seemed to be inappropriate … there would be an uproar in the NPR newsroom and I’m sure word would get out to other news outlets. The journalists here are not shy about raising a ruckus when they think our standards have slipped. 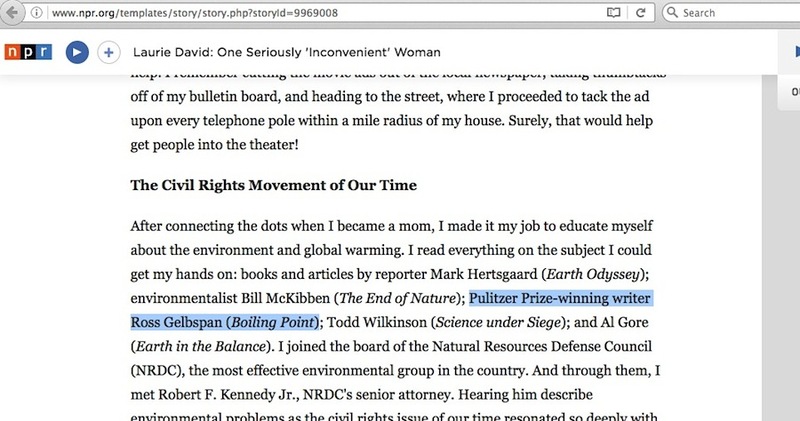 This is the same NPR which permitted book excerpts from Laurie David featuring a false accolade about Ross Gelbspan, the same radio network which allowed Gelbspan to prominently mention his favorite leaked memo ‘accusation’ bits where zero time was allotted for rebuttal, the same radio network which interviewed him more than one time, and the same radio network which years later featured Al Gore’s bit about the infamous ‘smoking gun leaked industry memo phrase’ “reposition global warming as theory rather than fact,” where the NPR writer offered not one word of curiosity about that awkward phrase. 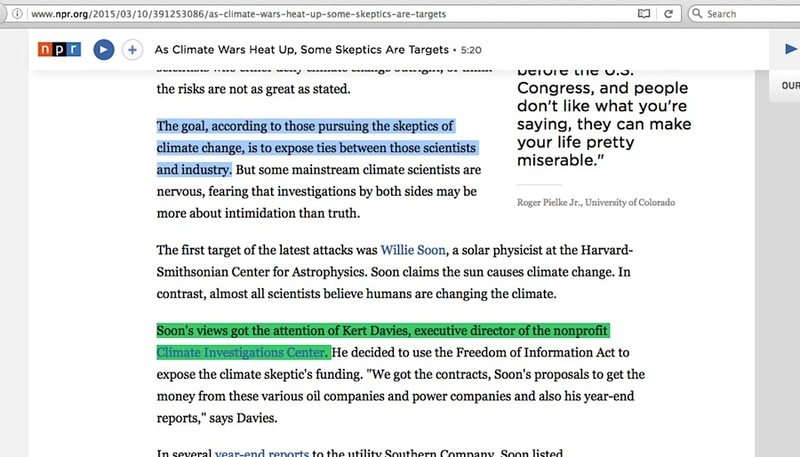 This is same NPR where any reporting questioning the validity of accusations about skeptic climate scientists participating in a conspiracy with fossil fuel industry executives is hugely difficult to find, while there is little doubt of what their position is concerning the certainty of man-caused global warming, and what their position is about anyone who questions that conclusion. 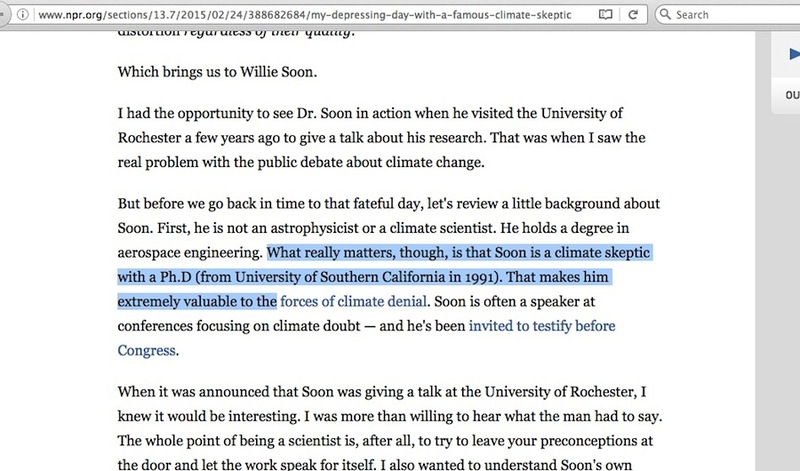 This is the same NPR which featured two attack pieces on skeptic climate scientist Dr Willie Soon here and here, in which the first piece said Dr Soon was valuable to the “forces of climate denial” (the now non-functioning link was to an older version of Dr Soon’s Heartland Institute bio page, later replaced by a newer one), and the second piece cited the same Kert Davies who I traced back to the time when the false ‘crooked skeptic climate scientists’ accusation first got its media traction. My take: The story was on the radar of at least some in the newsroom, but it seems to have fallen through the cracks. Given the latest repercussions—Democratic presidential candidate Bernie Sanders is among those calling for a federal investigation—the lapse was unfortunate. 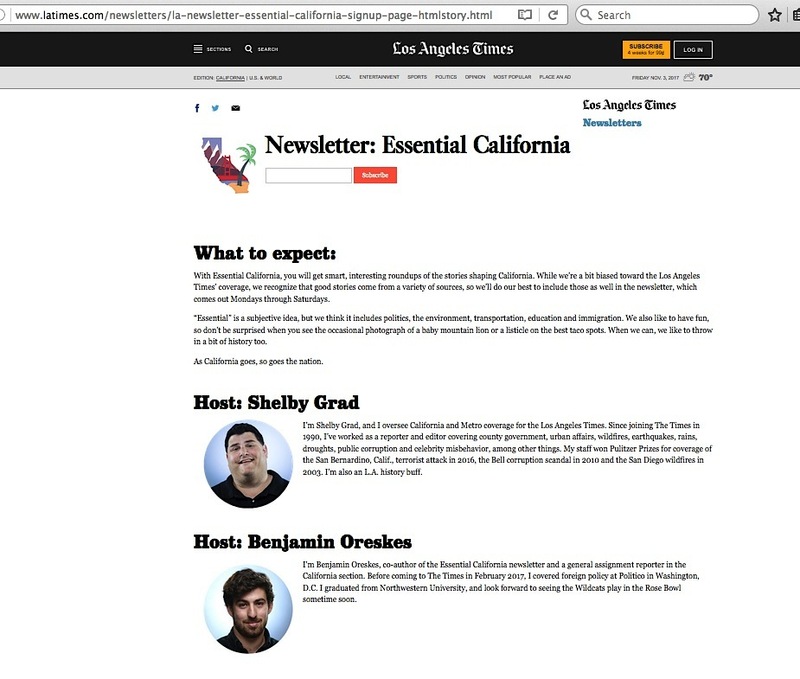 But the issue is still a live one, and it’s not too late for NPR to find some way of following up. 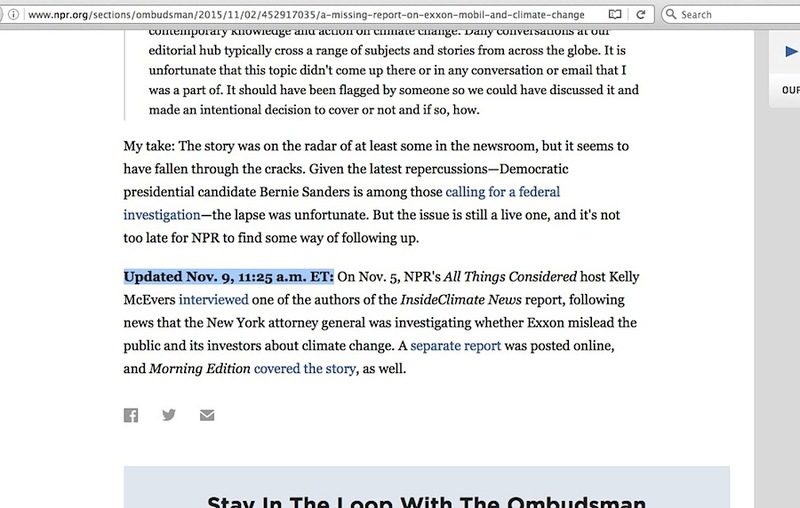 In an update to her piece mere days later, Ombudsman Jensen noted that the “Exxon Knew” story was finally being reported on at NPR. 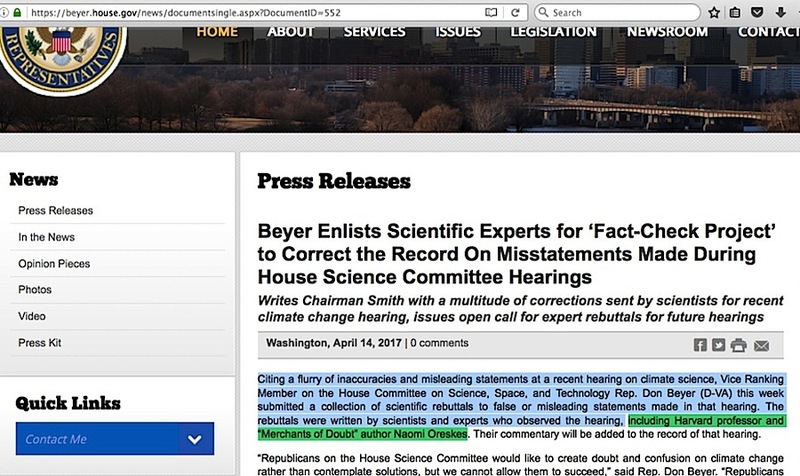 … along with myriad other problems surrounding Naomi’s efforts to portray skeptic climate scientists as ‘paid shills working for the fossil fuel industry.’ At minimum, they could have questioned the readily obvious political problem of a US congressman utilizing her services to rebut hearing testimony from a side of the issue which she is openly hostile toward. 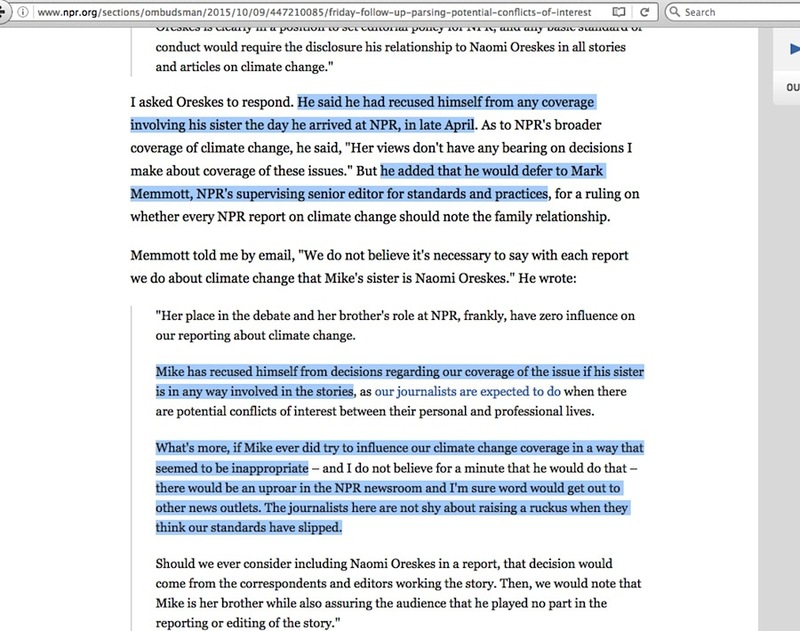 Given what seems to be the overall appearance of political bias at NPR from failing to tell the complete story of the global warming issue – a problem I first mentioned in 2011 here – there might not have been any need for Michael Oreskes to quash negative stories about his sister. 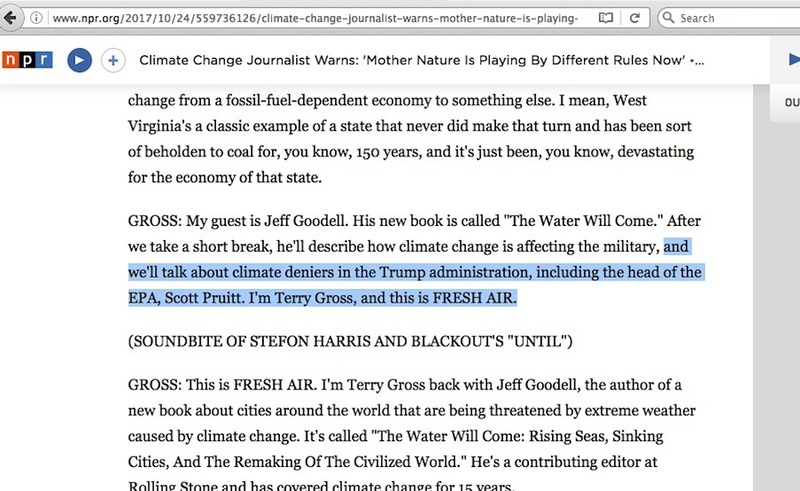 It’s conceivable that reporters and administrators at NPR may uniformly be able to summarize the collective global warming issue as “we can ignore climate deniers because the science of man-caused global warming is settled and because Michael Oreskes’ sister proved denier scientists are paid industry money to lie about it being not settled.” By way of example, it’s hard to miss the position of the NPR host here, where even her subsequent ‘effort’ to ask about alternative rebuttal came with a false premise label followed by the plain insinuation about settled science (click image to enlarge, full context here). 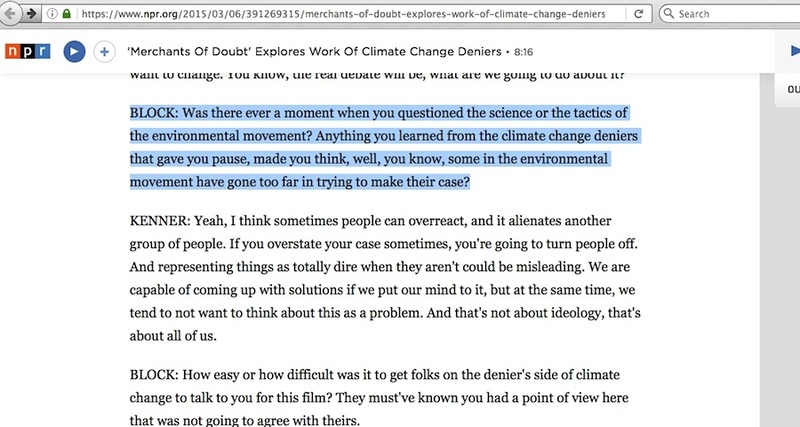 Has anyone at NPR questioned the science or the tactics of the environmental movement? 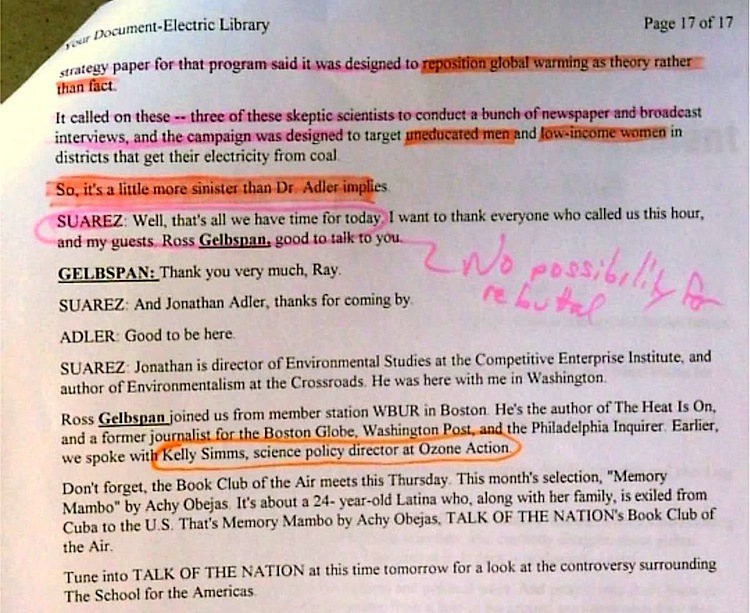 Ultimately, question here is not whether blood thicker than objective reporting at NPR. 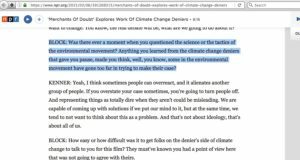 Considering how a similar global warming issue bias is quantifiable at the PBS NewsHour without any nepotism involved, it is whether unrestrained biased politically-driven advocacy trumps genuine journalism across the spectrum of the mainstream media. 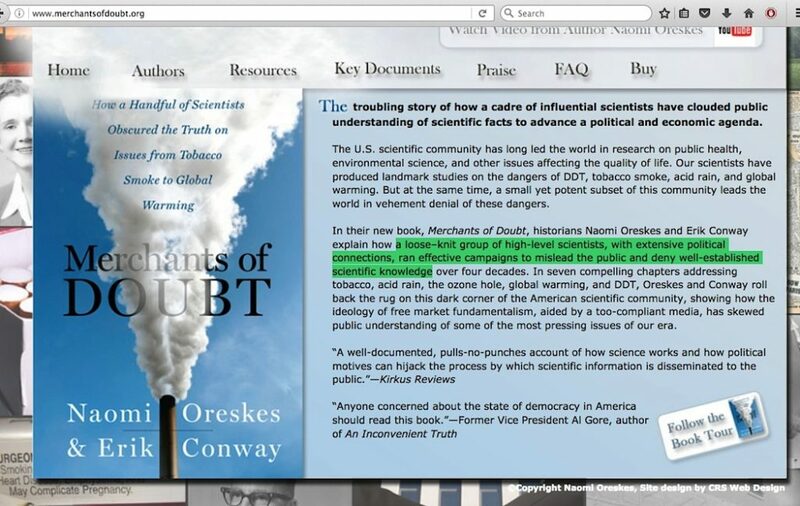 This entry was posted in mainstream media reporting and tagged Naomi Oreskes by Russell Cook. Bookmark the permalink.